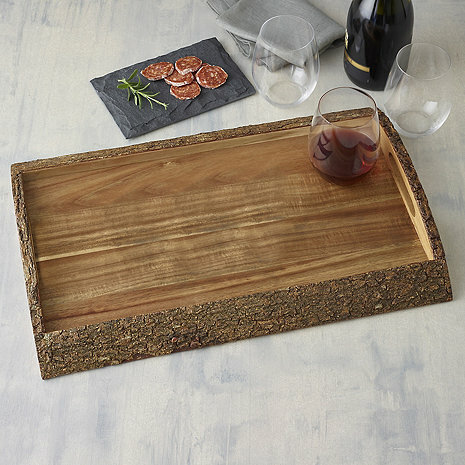 Food-safe serving tray crafted from solid Acacia wood. Live edge tree bark finishing adds to the warm, rustic appeal. Thoughtful details include sturdy carrying handles for easy serving and raised edges to make sure your wine glass doesn’t slip off. Personalize with large single initial etched and stained a burnt brown for contrast and readability. Is there a protective finish on this product? If not, what do you recommend? BEST ANSWER: Yes there is a protective covering but I also added some teak oil to add an extra level. Very nice product & looks really cool, too! The Woodland Live Edge Tray does have a finish on it. You could use a product to prevent water stains if you wanted to. There were not care instructions included in my package. Can you set cheeses, etc. directly on the tray or will it leave a mark or grease stain?